Saturday was a gorgeous day in Calgary and I spent the afternoon with some friends out south of Strathmore at the home of quilt pattern designer, Lorraine Stangness, for her annual quilt show and a huge sale from her store Country Creations. 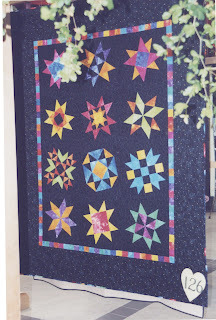 The local quilting guild that I'm a part of also held their show there in one of Lorraine's farm outbuildings. I'll let the pictures speak for themselves. Some of these quilts were just massive King sized - haven't done one that big yet! My largest quilt to date is a queen sized quilt, but it only hangs far enough to cover the top mattress. 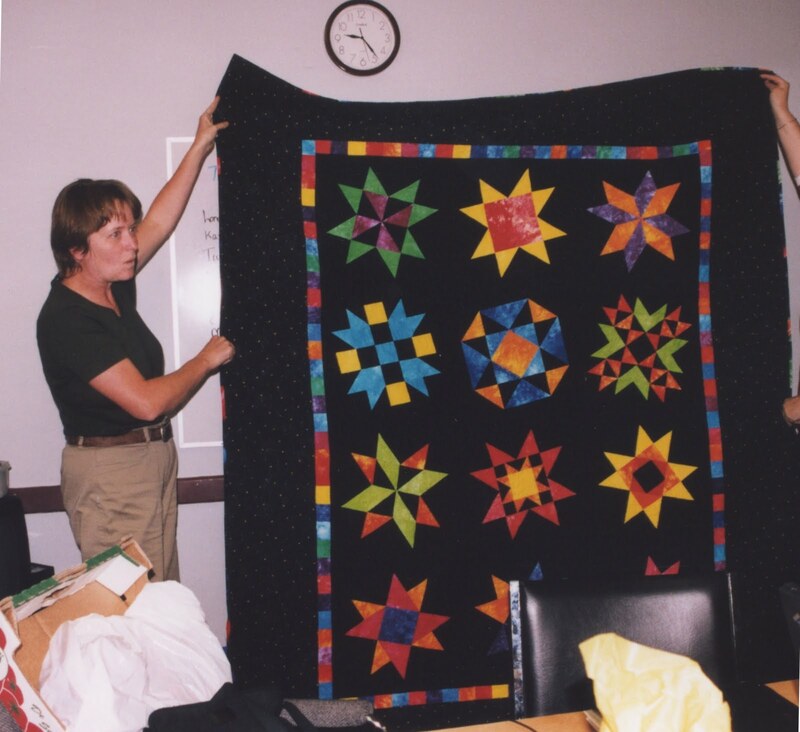 What's the largest quilt you've made? Did you quilt it yourself? As a farewell gift before we moved here, my previous guild, The Blackgold Quilt Patch, in Leduc, Alberta gave me a set of house blocks that were pieced by the members at that time. These alternated between being on my design wall to being stashed away in the closet as I hemmed and hawed about how to put them together into a quilt. Originally, the thought was to have one large quilt with cobblestone streets between the houses. Well, that would have resulted in a King size plus quilt and no matter how I rearranged the blocks, it didn't look quite right. Next, I spread the blocks out on the floor and split them in two groups, with an assortment of sizes in each group. Playing around with the layout became more fun with the smaller number of blocks and soon I had an arrangement that I actually liked! I quickly took out my camera and snapped a couple of pictures. The same was done with the second set of blocks and again, another picture. So, now I had the blocks arranged and it was time to figure out what to put in between. The cobblestone fabric I bought originally just didn't do anything for the blocks, so they were sent back to the closet while ideas peculated in my head. I printed the photos out and hung them up by my sewing machine, hoping they would "talk" to me. And they did! These quilts are identical in size and will someday be put on the bunk beds that will go in the guest bedroom when it is finally vacated by the youngest son. What's the longest it's taken you to finish a quilt? I have so many projects on the go that it's a super feeling to complete something - especially something that's been on the to-do list for a long time! 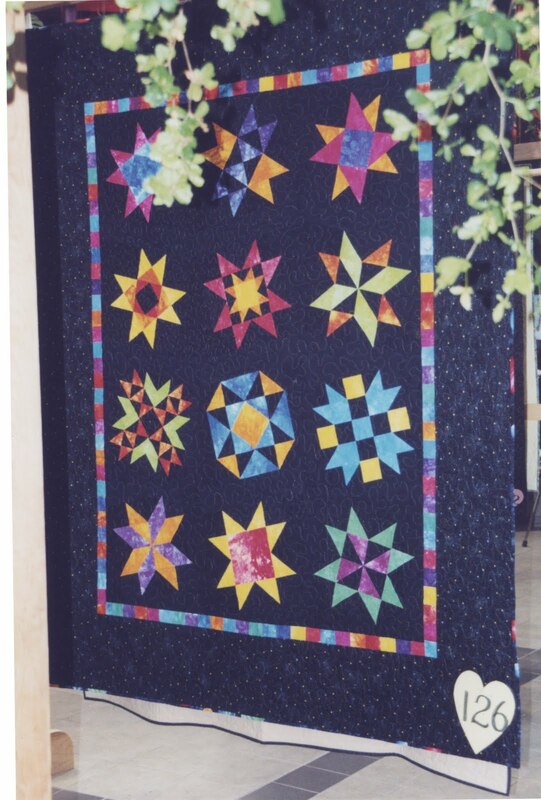 This quilt was bought as a kit from a local quilt shop called Traditional Pasttimes. It is my go-to place when I'm looking for the traditional country colours that I love to decorate with. My home is a 1970's bi-level, but is decorated as if it were the log cabin that I've always wanted to have and this little quilt is quite at home here. It will probably be moved a few times before it finds it's place here, but for now, it's front and center on the coffee table in the living room. To give you a sense of the size, this piece is only 16" square and the little 16-patches are 1.5" square. It was definitely challenging to work with such small pieces, but the instructions were awesome. What is the smallest quilt you've made? Just ordered some Procion MX dyes online - so I can make some hand-dyed fabrics. It's been a few years since I've done this - maybe 10 years! Yikes! Time flies! I did a jam jar dyeing class with a friend and the end result was a rainbow of 24 fabrics in bright colours. I made a quilt for my youngest son from these lovely fabrics and went hunting for a photo. Unfortunately, the photos I found do not give any sense of the brilliant colours or show any of the details of the quilting - my first attempt at quilting with metallic thread. The blocks were from an online BOM from Planet Patchwork. This was my first quilt that was not done with traditional country colours and the results were worth it as it's still one of my fav's! Do you have any hand-dyed fabrics? What have you made with them? I had so much fun making the maple leaf blocks for the potholders that I made a few more and put them together for a little quilt that could hang on the wall or be used as a table mat. I liked the way the blocks form a wreath when placed with the stems all in the center. I haven't done any machine quilting with metallic thread for a while and this project was in need of some sparkle, so out came the gold metallic thread. It took me a while as the thread kept breaking as I quilted. To prep for quilting with the metallic thread, I ensured that my bobbin area was clear of dust and lint, put in a new needle and loosened the top tension a bit. Even with all that prep, it was disappointing to have the thread break as often as it did. Anyone else have any tips for quilting with metallic threads? Although I have some large projects on the go, it's always fun to work on something small, just for the satisfaction of finishing something. Because this week didn't allow me a lot of time for sewing, I put aside the larger projects and made a pair of potholders. These are great projects for using up left-over pieces of batting and for trying out a block pattern. The maple leaf block finishes at 6" square and is surrounded by a border of the same fabric for a 8" square finished potholder.